Calley never even heard the word yoga growing up in Ridgefield Park, New Jersey. No one had! While teaching art at an alternative high school, Calley was introduced to yoga at 21. 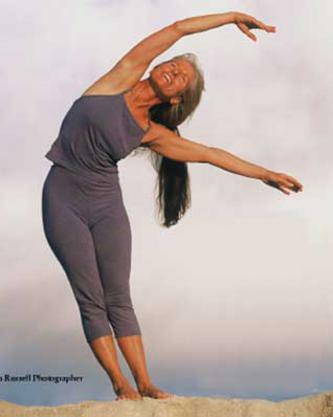 Within 5 weeks, she had 5 teachers and a dedicated daily practice that has continued unabated. At first, her practice was traditional, with a lot of efforting to perform it perfectly. Over time, the stresses of life, childhood injuries, endless striving, a difficult divorce, and years of professional landscaping came to a head. Her back ‘went out’ ~ excruciatingly out, and her joints began to hurt. For more than 20 years, the pain moved around but rarely left her lower back. Seeking help from yoga, supplements, alternative medicine, acupuncture, massage therapists, 14 chiropractors and a fine osteopath, Calley’s pain lessened but never left. Every move had to be conscious. Calley resolved herself to a life of pain. Thankfully, that is history now. 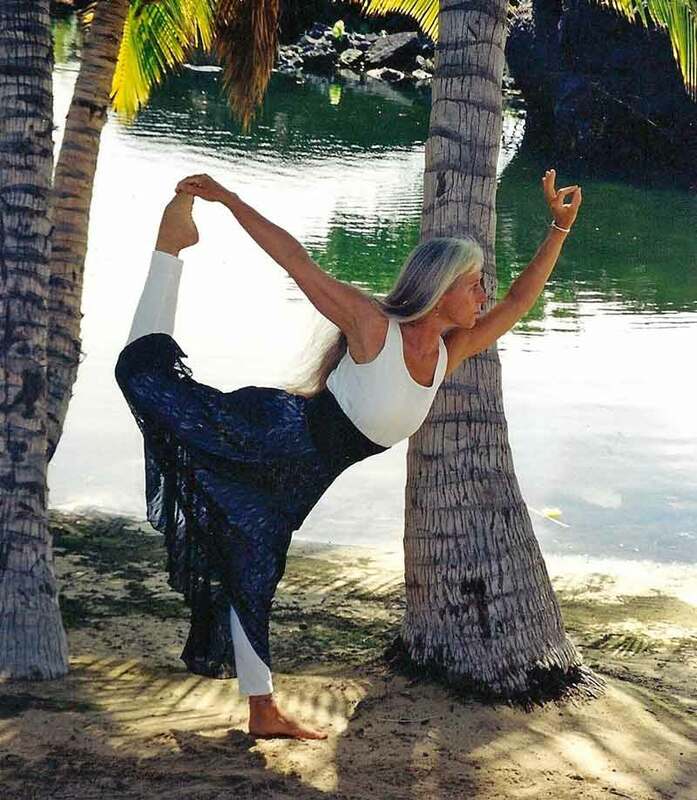 Through skillful X-ray diagnosis and weekly adjustments by retired Kona chiropractor Dr. Rhody Edwards, in combination with a daily slow flow practice of inner kindness integrating breath, sensitivity and movement, Calley slowly, amazingly evolved out of pain. Endlessly grateful, to Calley, this awakening is Grace. 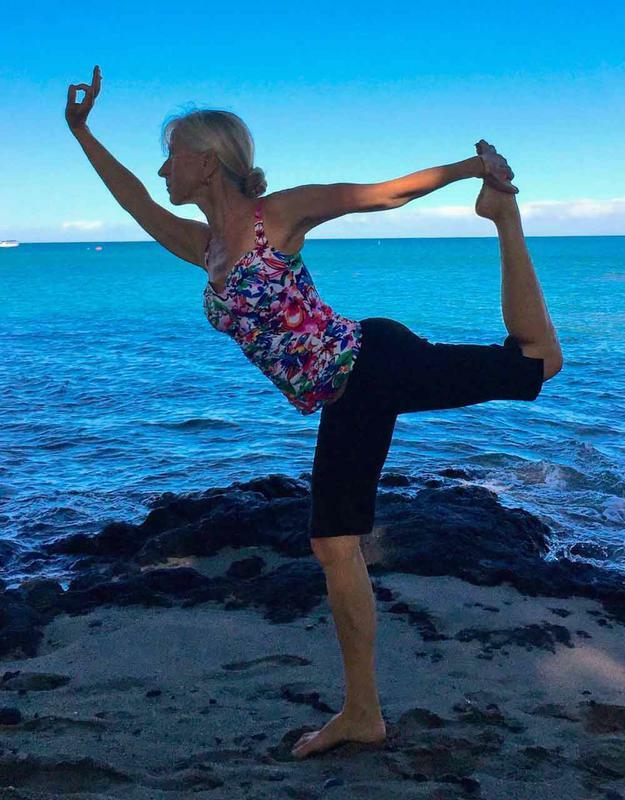 Teaching yoga on the beach since 1997, Calley has helped thousands of students out of pain, stress, negativity, old patterns and stiffness. Through paying attention to guidance, the practice continues to evolve and become ever more effective, joyful and more dynamic.